All of the major difficulties associated with the design of blowback machine guns stem from excessive movement of the cartridge case during the time of action of the powder gas pressure. The preceding paragraphs show how the use of advanced primer ignition causes the initial high-pressure phase of the propeliant explosion to be expended in stopping the forward motion of the bolt, with the resulting advantages of a lighter bolt and a slightly higher rate of fire than would be permissible with plain blowback. These advantages are attributable to the fact that the rearward motion of the bolt is delayed for approximately one-thousandth of a second. thus halving the impulse which is effective in blowing back the bolt and also reducing the time during which the bolt is accelerated to the rear. Since this time is reduced, the average rearward velocity of the bolt can be higher during the interval without exceeding the allowable movement.
' j of the bolt beyond this time, it is necessary to resort to a special operating system referred to as "delayed blowback". 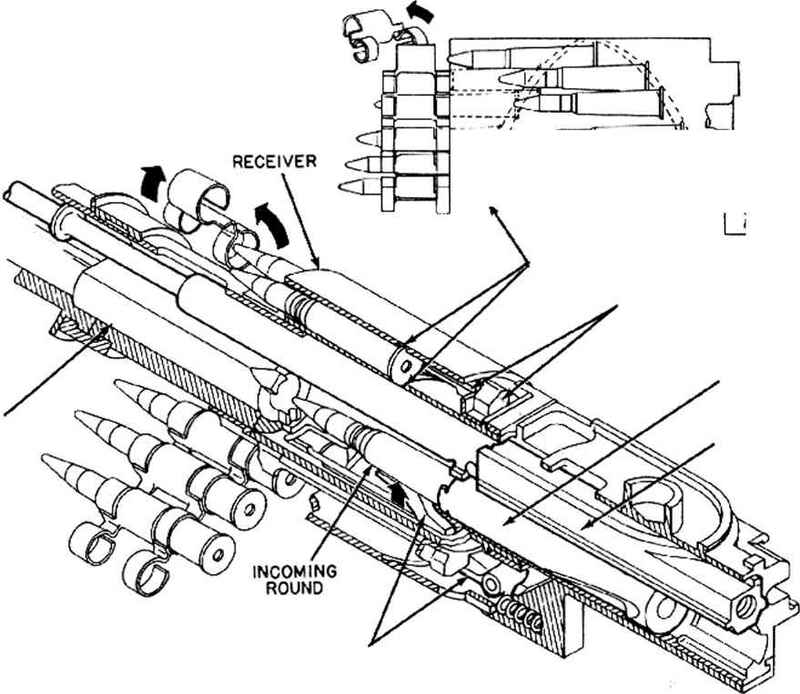 of operation in which the bolt remains locked until the peak powder gas pressures have passed and a safe operating limit is reached after the projectile clears the muzzle. The bolt is then unlocked by-some means so that it can be blown back bv the residual pressure with sufficient energy to perform the remainder of the cycle of operation. In this system, the time at which the bolt is unlocked can be controlled in the design so that any desired portion of the residual pressure can be utilized. Of coursc, the bolt must be unlocked while there is still sufficient impulse available from the residual pressure to produce the required operating energy. Any gun in which the bolt is unlocked while there is still some residual pressure is subject to some blowback and partakes of some of the characteristics of the delayed blowback system. Such guns includc certain gas-operated and short-recoil-oper-ated weapons in which the bolt is unlocked almost immediately after the projectile has left the muzzle. However, in guns of this type, the operating energy does not conic primarily from blowback hut is derived mainly from the action of the gas piston or from the motion of the recoiling parts; therefore these guns will not be described at this time. The present analysis is conccrncd only with guns in which delayed blowback is the main source of energy.